There’s an abundance of articles attempting to answer these questions, either based on personal experience or on job offer data. Τhere’s so much more activity in machine learning than job offers in the West can describe, however, and peer opinions are of course very valuable but often conflicting and as such may confuse the novices. We turned instead to our hard data from 2,000+ data scientists and machine learning developers who responded to our latest survey about which languages they use and what projects they’re working on – along with many other interesting things about their machine learning activities and training. Then, being data scientists ourselves, we couldn’t help but run a few models to see which are the most important factors that are correlated to language selection. We compared the top-5 languages and the results prove that there is no simple answer to the “which language?” question. It depends on what you’re trying to build, what your background is and why you got involved in machine learning in the first place. 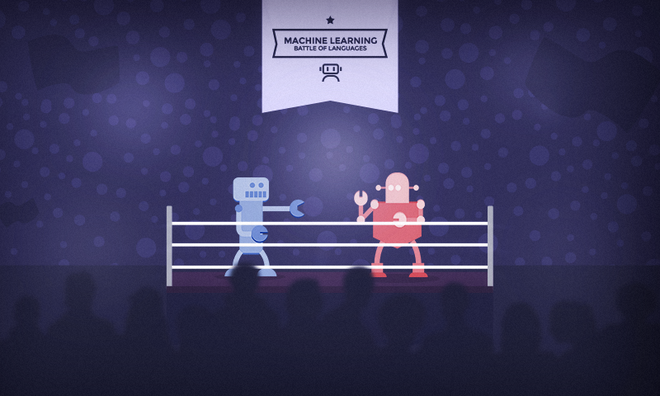 Which machine learning language is the most popular overall? Python is prioritised in applications where Java is not. 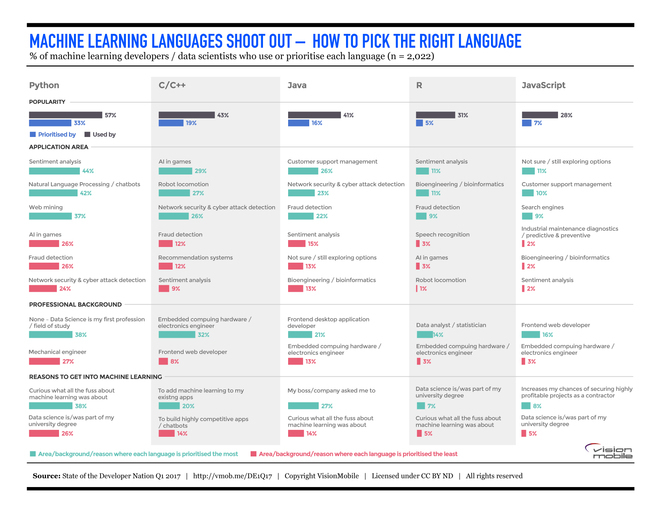 Our data reveals that the most decisive factor when selecting a language for machine learning is the type of project you’ll be working on – your application area. In our survey we asked developers about 17 different application areas while also providing our respondents with the opportunity to tell us that they’re still exploring options, not actively working on any area. Here we present the top and bottom three areas per language: the ones where developers prioritise each language the most and the least. Artificial Intelligence (AI) in games (29%) and robot locomotion (27%) are the two areas where C/C++ is favoured the most, given the level of control, high performance and efficiency required. Here a lower level programming language such as C/C++ that comes with highly sophisticated AI libraries is a natural choice, while R, designed for statistical analysis and visualisations, is deemed mostly irrelevant. AI in games (3%) and robot locomotion(1%) are the two areas where R is prioritised the least, followed by speech recognition where the case is similar. Professional background is pivotal in selecting a machine learning language. Second to the application area, the professional background is also pivotal in selecting a machine learning language: the developers prioritising the top-five languages more than others come from five different backgrounds. Python is prioritised the most by those for whom data science is the first profession or field of study (38%). This indicates that Python has by now become an integral part of data science – it has evolved into the native language of data scientists. The same can not be said for R, which is mostly prioritised by data analysts and statisticians (14%), as the language was initially created for them, replacing S.
For Java, it’s the front-end desktop application developers who prioritise it more than others (21%), which is also inline with its use mostly in enterprise-focused applications as noted earlier. Enterprise developers tend to use Java in all projects, including machine learning. The company directive in this case is also evident from the third factor that is strongly correlated to language prioritisation – the reason to get into machine learning. Java is prioritised the most (27%) by developers who got into machine learning because their boss or company asked them to. It is the least preferred (14%) by those who got into the field just because they were curious to see what all the fuss was about – Java is not a language that you normally learn just for fun! It is Python that the curious prioritise more than others (38%), another indication that Python is recognised as the main language that one needs to experiment with to find out what machine learning is all about. It seems that some universities teaching data science courses still need to catch up with this notion though. Developers who say that they got into machine learning because data science is/was part of their university degree are the least likely to prioritise Python (26%) and the most likely to prioritise R (7%) as compared to others. There is evidently still a favourable bias towards R within statistics circles in academia – where it was born – but as data science and machine learning gravitate more towards computing, the trend is fading away. Those with university training in data science may favour it more than others, but in absolute terms it’s still only a small fraction of that group too that will go for R first. C/C++ is prioritised more by those who want to enhance their existing apps/projects with machine learning (20%) and less by those who hope to build new highly competitive apps based on machine learning (14%). This pattern points again to C/C++ being mostly used in engineering projects and IoT or AR/VR apps, most likely already written in C/C++, to which ML-supported functionality is being added. When building a new app from scratch – especially one using NLP for chatbots – there’s no particular reason to use C/C++, while there are plenty of reasons to opt for languages that offer highly-specialised libraries, such as Python. These languages can more quickly and easily yield highly-performing algorithms that may offer a competitive advantage in new ML-centric apps. There is no such thing as a ‘best language for machine learning’. If your first ever contact with programming is through machine learning, then your peers in our survey point to Python as the best option, given its wealth of libraries and ease of use. If, on the other hand, you’re dreaming of a job in an enterprise environment, be prepared to use Java. Whatever the case, these are exciting times for machine learning and the journey is guaranteed to be a mind-blowing one, irrespective of the language you opt for. Enjoy the ride! Christina leads the analyst team and oversees all VisionMobile data projects (big or small! ), from design to methodology, to analysis and insights generation. 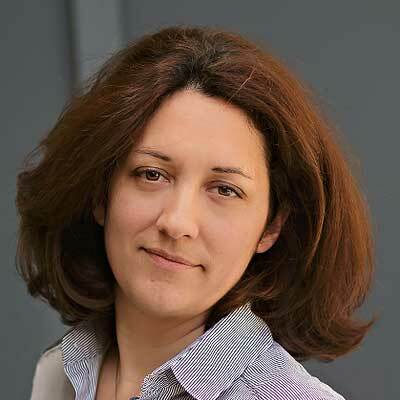 She is also behind VisionMobile’s outcome-based developer segmentation model, as well as the Developer Economics reports and DataBoard subscription services. While at VisionMobile, Christina has led data analysis, survey design and methodology for the ongoing Developer Economics research program, as well as several other primary research projects. Prior to joining VisionMobile, Christina served as Customer Relationship Manager for the Household Lending Unit of EFG Eurobank Ergasias. Her role placed her in charge of defining a CLV-based approach to managing customers and designing & supervising all direct marketing campaigns. Christina has more than 16 years of experience in statistical consulting, business & customer intelligence design, data mining and business analysis & forecasting. She holds an MSc in Statistics from the London School of Economics (LSE) and a BSc in Economics & Statistics from the University of Bath.